We have selected the most spectacular (most beautiful views and most central lain) Campsites for you, in many cases with swimming pools. You spend the night in a two person tent, which will be put up for you each evening, and will be taken down for you in the morning. (HECS1): Two days on safari, one overnight, for example: Arusha NP and Lake Manyara. (HECS2): Three days on safari, two overnights, for example: Tarangire NP. Lake Manyara and Ngorongoro Crater. (HESC3): Three days on safari, two overnights, for example: Arusha NP, Tarangire NP, and Lake Manyara NP. (HECS4): Four days on safari, three overnights, for example: Arusha NP, Tarangire NP. Lake Manyara, Ngorongoro Crater. (HECS5): Five days on safari, four overnights, for example: Tarangire NP, Lake Manyara, Ngorongoro Crater and two days at the Serengeti. (HECS6): Six days on safari, five overnights, for example: Arusha NP, Tarangire NP, Lake Manyara, Ngorongoro Crater and two days at the Serengeti. It is also possible to compose your own safari, extend your Safari or we compose another programme for you. (Look at the bookings form). In the morning you will be picked up at your hotel and you will enjoy a visit to your first National Park. En route to Lake Manyara NP, (with a little bit of luck) it is possible to see the first wild animals. There are regularly wildebeest, zebras, giraffes, and gazelles crossing the road. Also you will stop here to bring a visit to a traditional Maasai Boma (village), from these Maasai a bought a property. They will show you some typical Maasai dances and tell you about there lives. After arriving at the park you have a complete day of game driving. Lake Manyara is famous for its tree climbing lions that lie in a tree on a big branch. You will have lunch at the Hippo pool. Hereafter you drive to your Campsite. You can take a walk trough the village, and have your dinner. For today the Ngorongoro crater is on the programme. At the entrance they have arranged a small museum about the history and highlights of the Crater. After all formalities you drive to the crater rim, after 10 to 15 minutes you reach the top of the crater edge where you have a fantastic view over the whole crater. Hereafter you ride down into the crater, and enjoy all the characteristics that this park has to offer you. Your lunch is served somewhere at a beautiful spot in the crater. After the visit to the Ngorongoro crater you drive for a two-day visit to the grasslands of the Serengeti. In the Serengeti you have the opportunity to make a Balloon flight, (look under the headline Balloon Safaris on the head page). You sleep at a campsite in the Serengeti. After a full breakfast you drive through the national park of the Serengeti. Underway you make a stopover at Olduvai Gorge. There are fossils found here that date back for millions of years. Among them there are fossils of the predecessors of the present Homo sapiens (look for further information under the headline Parks and accommodations on the head page). You drive the whole day through the Serengeti, to see the endless plains, and large groups of wild animals. Hereafter you drive to your Campsite for dinner and to catch up on what you have been seeing all day. If you have booked a balloon flight, you will be picked up by Serengeti Balloon Safaris at six in the morning. After the flight and brunch you are brought back to your Campsite to resume your program. Today you will have another full day of game driving to the Serengeti NP. Hereafter you drive back in the direction of the Tarangire NP to visit the last park the next day. Today you will take a visit to the Tarangire NP. You pay visits to several swamps, and you have a beautiful view on top of one of the hills. Which overlooks part of the park and all the wild animals that graze the area. Tarangire NP is famous for its large group of elephants. Nowhere in the world can you see as many elephants on square km as here. After a complete day game driving through the park you are driven back to your hotel, where you can make a refreshing dive in the swimming pool, or you can take a nice hot shower. Spirits (alcoholic and soda’s), personal toiletries and tips. You can also book one or more hotel/lodge over night stays to combine with your camp-site safari (look for (budget) hotels/lodges at Parks and accommodations). You can indicate this on the Bookings form. 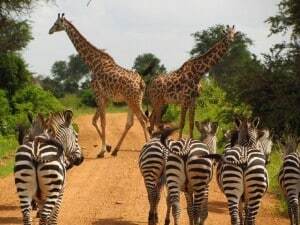 If you book a safari for two persons, that means you pay a little bit more, but then you are sure it’s only the two of you in the car, so that you book a private safari. Some other companies want to save money, and without your permission they put two or three other clients into your car. We also want to give you that possibility to travel with some other travelers, but you have to tell us yourself. It can save you some money.